Hey, folks, here's mine and my sibling's classic customs! All customs here have either been playtesting, are being playtested, or are going to be playtested soon. Something to note, if you're expecting customs that could be considered competitive, you're in the wrong place. My siblings and I are very casual players, and all of our customs generally are balanced on the side of safety, to the point where they'd probably all be considered overpriced for competitive play. Me and my siblings all create different units, so each one belongs to one of us, but we all work together to balance them and such. Tahdren is an elf mage that lost the use of his legs to a sorcerer's magic bolt as he was summoned to Valhalla, which if he hadn't been summoned would have killed him. Ullar was a bit shocked to find himself with a crippled warrior; calling on the aid of Jandar's soulborg named Zetacron, and the healing techniques of Einar's healer Durnipa, Ullar gave Tahdren new legs. 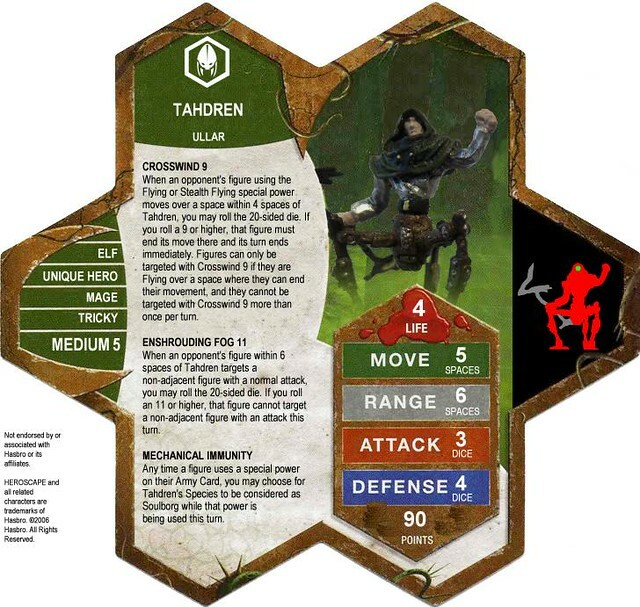 Tahdren uses his magic skills to manipulate the weather, knocking down flying foes and enshrouding his allies in fog, and thanks to his soulborg legs, he has become immune to such things that do not affect soulborgs. The figure used for this unit is the Mage Knight Technomancer from their Unlimited set (#052-054), repainted. Tahdren is my design. 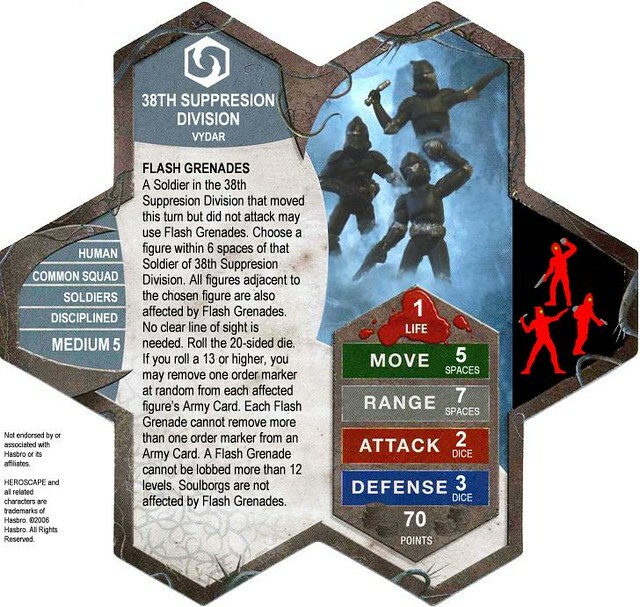 The 38th Suppression Division come from the not too far future of earth, where they act as a division whose purpose is to subdue the enemy armies instead of killing. Using their Flash Grenades, they can stun the deadliest of foes, instead of resorting to killing. The 38th Suppression Division are the first of many that Vydar plans to summon from this futuristic age of earth. The figures used for this unit are the Star Wars Clone Trooper Gunner (#11 from Revenge of the Sith), Clone Trooper Grenadier (#09 from Clone Strike), and Elite Clone Trooper Grenadier (#11 from The Clone Wars); all repainted. The 38th Suppression Division is my younger brother NatureBoy's design. Arnegrim of the Tarn stops to survey the battle. From what he can see it is going well. Up ahead, the two brothers, Finn and Thorgrim, lead the charge against the evil Dreadgul warriors who have invaded their home. Before he can rejoin his brethren, the warrior hears a noise and turns, just in time to see a horned Dreadgul sneaking up behind him, hoping to catch him unawares. Though he is filled with rage at this cowardly tactic, Arnegrim barely parries the first blow from his snarling opponent. The second attack has enough force to send him stumbling backward. The third knocks him to the ground and the sword from his hand. The Dreadgul smiles and raises his own sword above his head and prepares to bring it down in a killing blow. Arnegrim curses his luck and prays the Valkyries will think no less of him for dying this way. The sword begins to drop, blade gleaming in the sun, and lands with a loud CLANG! on the sturdy shield of Ogmundar. Before the Dreadgul can respond, he is quickly dispatched by Ogmundar who then turns and helps his fellow warrior to his feet. There is a quick nod of thanks and recognition between the brave warriors and then they are off, Arnegrim to the front lines and Ogmundar to the aid of another of his brothers-in-battle. The figure used for this unit is a repainted and modified HeroScape figure from the Rise of the Valkyrie set, the Tarn Viking Warrior with the spear. Ogmundar is my older brother Troll Brute's design. Just sit right back and you'll hear a tale of Ulf, the Viking Berserker. Ulf has always had a wild side to him, people would say the wild side is the only side to Ulf. Since the time his chubby little legs could carry him over the hills, he has run over the hills and the plains and swam the oceans. We'll pick it up a little later, when he was twelve: yes, uh, you see, twelve was the age when he took his father's sword in hand and left his home and mother and father, and set out in the world on his own. Ulf, a boy full of passion... for everything. Ulf, full of wildness. Many years later, in the town of... it doesn't really have a name, at least he didn't remember it; one of the biggest things that would ever happen to him, happened to him in that time: there was a man there, a large man, who stood to the height of six foot eight, with bulging arms, and a slightly smallish head, carried a hammer around, he called himself... THE MIGHTY THOR! Ulf challenged him to a dual to the death. Of course, Ulf wasn't the brightest young lad, nor the bravest, but for sure he was the dumbest, the wildest, and the craziest. But those were the attributes that helped him defeat the Mighty Thor, bringing him down with one swoop of his sword. He took the Mighty Thor's hammer, and went back out into the world, "I hath slain the Mighty Thor!" he said. The hammer being much larger than normal hammers, scared most people, for someone who could lift such a hammer must be the most powerful man alive. Of course, he didn't do much with this, he went from town to town spending all the gold he earned, stole, or beat out of people, on good ale, bad ale, or any kind of ale he could get his hands on, to be sure. He vikinged around the world awhile, doing the kind of things vikings do the best. 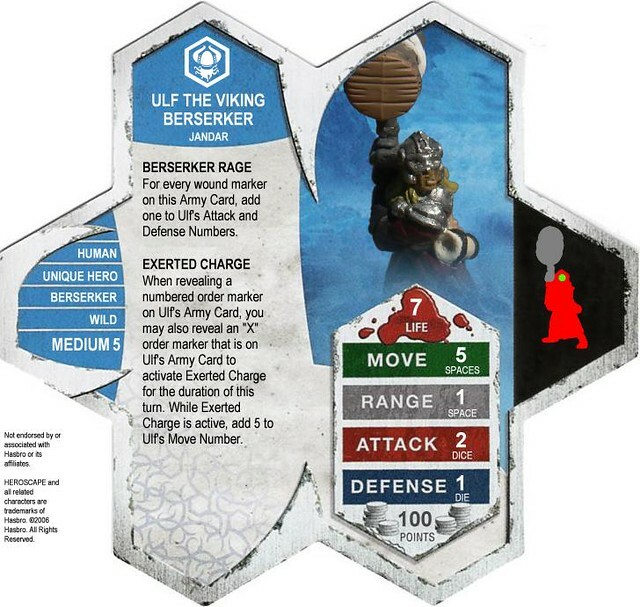 With his large hammer and his good luck, he earned the title: Ulf the Viking Berserker! The figure used for this unit is a repainted and modified HeroScape figure from the Rise of the Valkyrie set, the tan charging Tarn Viking Warrior with a sword. Ulf is my older brother The Black Headed Luck Sucker's design. The Warriors of the Red Moon are the elite warriors of the Tamue-Shae. Given to the Guardian of the Temple of the Red Moon at birth, and raised there, their entire lives are devoted to studying the ways of their gods and how to best follow their annihilative orders. 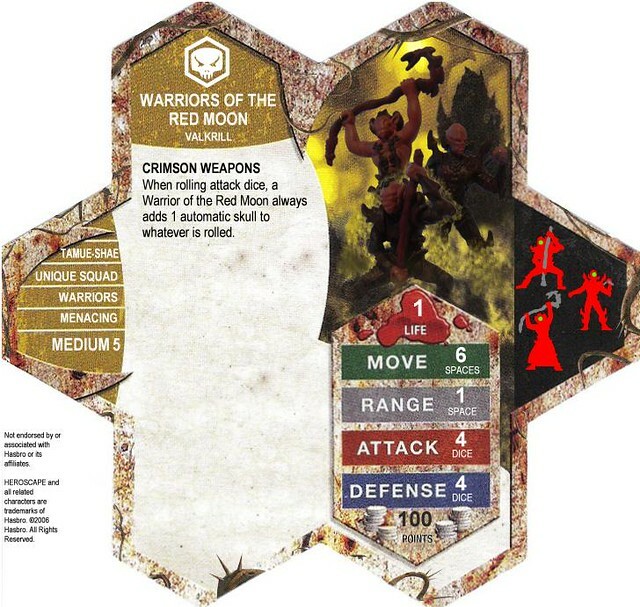 The Warriors of the Red Moon are the first that Valkrill summoned to Valhalla; their devotion to their belief of utter destruction and their deadly fighting tactics caught his attention above many other choices, but now witnessing their power and skill, he turns back to the race of the Tamue-Shae for more warriors to swell his ranks. The figures used for this unit are the Star Wars Yuuzhan Vong Subaltern (#59 Universe), Yuuzhan Vong Warrior (#60 Legacy of the Force), and Yuuzhan Vong Warrior (#60 Universe); all repainted and some modified. The Warriors of the Red Moon is my design. Known to his enemies simply as The Troll Brute, Grauk is one of Utgar's strongest warriors. A bully, he uses his sheer size and strength to clear huge swathes through the battlefield by shoving his opponents -and occasionally his allies- away, often to their deaths. His huge club has been the last sight of many an unwary foe, and his skin, toughened in the desolate northern mountains of Feylund, is thick enough to stop all but the most deadly of weapons. Though far from brilliant, his brutishness and ferocity strike fear into all his enemies. Those, that is, that haven't been crushed beneath him. The figure used for this unit is the Dungeons & Dragons Mountain Troll (#50 War of the Dragon Queen); simply rebased. Grauk the Troll Brute is my older brother the Troll Brute's design. Wow, these are simply awesome! They are completely original, imaginative designs with some very fun abilities. They seem balanced, too! I bet you have fun with those! Nice! I particularly like Ulf. These are all customs that have been brewing in our household for a long time (especially Tahdren, I did his original design probably 3+ years ago), but not till now did I put the effort into getting a flickr account and making this thread. We've got plenty more coming, but these are the only four we've finalized. Unfortunately, we haven't had the time for playtesting our customs much lately, so the next ones I put up are likely going to be minimally playtested (unless we suddenly find time). 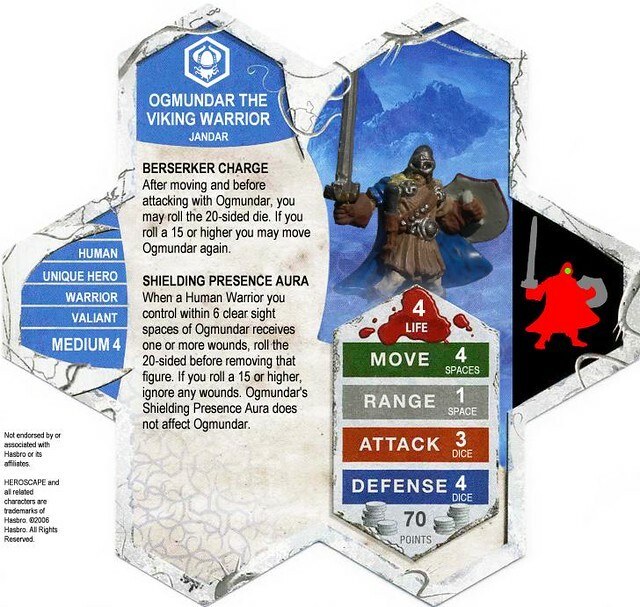 OP updated with Ogmundar's bio. It's the only one we have yet (written by Troll Brute), but there should be more on the way. Theoretical customs, though, are my specialty. Seriously, I have lots and lots of theoretical customs, just they are all mostly very rough and not likely that good; these ones posted here are just the few we've found figures for and have spent a lot of time making sure they work well. On another note, we have a new unit coming through soon made by me. Hopefully I'll have it up soon, I just need to make some art changes. The Warriors of the Red Moon, Valkrill's newest fighters and only Unique Squad, are up in the OP. Grauk the Troll Brute is here! He's Utgar's newest monster, and the biggest bully in the game. He's prone to shoving the smallfolk around (his enemies and allies), and often just for the heck of it. Friendly warning, don't stand near the lava. EDIT: And in other news, my brother the Troll Brute just signed-up on our beloved site here, under the surprising user name of (you'll never guess)... TrollBrute! Last edited by Viegon; February 23rd, 2012 at 08:17 PM. Ah, Troll Brute, my namesake and favorite custom. I sent Vie his Bio, hopefully it'll be up soon. And added I just have, my dear brother. And in other news, we've begun our playtesting process for the next unit, the 64th Swamp Division (designed by Zettian Juggernaut). They're coming along well, but will likely still be awhile before they're finalized.